Aderet’s recent release of the digitally remastered HASC’s A Time For Music Concerts Collection: 1-7 has brought back some very fond memories of my youth. Let me explain. Nowadays, Jewish Music is a much larger and more sophisticated industry than it was back then. The HASC concert was the biggest and most anticipated event back then, and for us youngsters the release of the cassettes, videos, and later CDs, were eagerly awaited. Truthfully, however, that really has nothing to do with my love for the early HASC concerts or the memories that they bring me. I remember the summer of 1988, the first time I went away from home as an eleven year old boy to sleep away camp, Camp Kol Torah. The whole summer people were playing and talking about this amazing concert that had come out on double cassette, and after hearing parts of it over the summer, I decided that I had to buy it for myself. Time passed by and somehow the next summer of camp was only a few days off and I had still not purchased it. My siblings and I were staying at my grandparent’s house overnight, since my parents went to play at a wedding in Detroit and I finally had the opportunity to walk to the bookstore where my grandfather worked to purchase this amazing concert. Imagine my confusion when I looked at the music section and saw not one, but two A Time For Music Concert double cassettes staring at me. One had a gold cover (volume one) and the other a blue cover (volume 2). Not only did I not know which one I had listened to the summer before, but I didn’t have the money for both of them although I really wanted to get both of them. I reasoned if the concert I had listened to the previous summer had been so awesome, then chances were both of these concerts were amazing. I don’t remember the next details exactly, but somehow my grandfather became aware of my dilemma and offered to let me “borrow” the money from him. Of course when I tried to pay back the loan to him and then to ybl”ch my grandmother, they wouldn’t accept the money. I had one problem left and that was listening to the the albums. It was already the 3 weeks! All the cassettes got packed for camp, along with my Sony Walkman (that I still have, but haven’t tried to use in years). Boy was I waiting for chatzos on Yud Av! That day my bunk (Bunk Tahara for those CKT veterans) was playing basketball in the gym (on the 1st court) for first activity. We did not get to play basketball often, since we were still from the younger bunks, so it was a big deal. I don’t remember the exact time of chatzos, but it was in the middle of first activity. I brought my walkman and tapes to the gym with me, and told my counselor that I would only play until chatzos. After that, I had very important music to listen to. 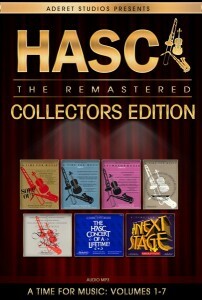 That day, was the first of many that summer that I enjoyed both volumes of the HASC concerts. I became a huge HASC concert fan, and waited every year for the new concert to come out. Seeing that this new collection was released, it has afforded me to relive many memorable memories, and to listen, once again, to some really amazing times in Jewish Music history, in crystal clear sound. To recap all 114 songs would be very tedious, however, I will give a brief synopsis of each concert and point out a few of my highlights and favorite songs. HASC 1: The concert begins with a musical overture by The Neginah Orchestra, featuring the first HASC theme song, and a medley of songs from the night’s featured performers. It is arranged and conducted by Yisroel Lamm. The performers at the concert were Mordechai Ben David, Avraham Fried, and Yoel Sharabi. The Master of Ceremonies is Zale Neuman. My favorite songs from MBD were Yidin (which incidentally was performed in part or the entire song at three of the first four HASC concerts), Rachem, and Let my People Go, with a killer saxophone solo by Arkady Koyfman. My highlights from Avraham Fried are Tatenyu, Sholom Aleichem (Regesh’s song, which in my opinion, Avraham Fried’s version at this concert is the best I ever heard it performed), and Forever One. Yoel Sharabi sings a few songs; my favorite is V’ani B’chasdicha, and his performance on the recorder in the Recorder Medley. It was a very simple concert, as far as HASC concerts go, but for 1988, it was quite a trend setter, and a real joy to listen to. HASC 2: This concert was also a groundbreaking event. The music was performed by a 60 piece orchestra featuring Yisroel Lamm and the Philharmonic Experience, and really has a sweet classical sound to it. The overture once again featured the HASC theme song, but it evolved into a classical sounding piece. There is also a choir under the direction of Moshe Mona Rosenblum called 101 Talented Voices. I am not sure if there actually were that many (I only counted 69 total between the adults and children) but it is still quite an impressive choir. Their highlight is singing Avraham Yogel, featuring solos from Laibel Hashel z”l. Mordechai Ben David is once again the main performer, singing among other songs, Meharoh, Golus Pharoh (which is what it’s called on the cover of my original cassette from the concert, yes, it is on the original cassette despite the advertisement saying otherwise), a couple of medleys with MBD classics, Someday followed by Yerushalayim, and Ribono Shel Olam, sung together with the 101 Talented Voices. There was a 25 year tribute to Jewish music featuring performers who sing one song a piece, including Canter Yakov Motzen, Benzion Shenker, Or Chadash, Pirchei, D’vekus, and Disapora Yeshiva Band, featuring Avraham Rosenblum, however a few stood out to me at the time. Abie Rotenberg sings the first of many special songs he composed for HASC, titled Who Am I. Jo Amar sings Barcelona, with special words added for the evening. The Piamenta Brothers perform Asher Bara with the crowd continuing to sing after they finished, prompting the MC, Zale Neuman, to remark “Alright, calm down, calm down”. The highlight of the concert has to be Shlomo Carlbach z”l’s HASC debut. He was announced as the Rebbele of Jewish Music, and after he finished singing (he sang for under one and a half minutes) the crowd continues to sing, prompting Zale to remark “Alright, alright, you’re all hired next year!” As someone who has met and spent time with Zale over the years, it is but a tip of the iceberg of his witty and spontaneous lines. HASC 3: Once again, Yisroel Lamm and The Neginah Orchestra was the Orchestra of choice, this time going under the name of The Jerusalem Bandstand. The overture also once again features the original HASC theme song in a swing style. They also perform an instrumental Hora Medley and a cute medley of shul songs, named Rhapsody in Shul. The main performer of the evening is Avraham Fried. My favorites of his are the Opening Medley (check out the rocking slap bass in Lefonov Na’avod), Tanya, A Yossi Green Medley (featuring some of his early hit English songs), and Avraham Yagel (with some chazzanus at the beginning and some more killer slap bass). A group called Harmony, featuring Avraham Rosenblum, Moshe Yess z”l, Avrumie Flam, Gershon Veroba, Jonathan Hill, and Matthew Hill (I am assuming the world famous drummer) sing a cute song called Harmony, and a greatest hits medley, featuring My Zaidy, Malchuscha, Chozok Yimalei, and Od Nagiya. Abie Rotenberg sings another one of his especially composed for HASC songs, A Small Piece of Heaven, my favorite from all of his special HASC songs. There is a special guest appearance by Mordechai Ben David, and he sings a medley featuring among other songs, Eliyahu Hanavi and Yidin (with more slap bass) and Sameach, a Boruch Chait song, featuring bouzouki by Avram Pengas. This was another very enjoyable concert. Does Kol Torah still exist? Did Zale ever share any Uncle moishy stories? Yes, of course Kol Torah still exists! It is bigger than ever! I did get some good stories from Zale! He is a riot and full of ruach! On HASC 3 – Does anyone know where the 2 songs of the Shabbos Medley sung by Avrohom Fried (Yismechu & Rabos Banos) are originally from? Good question Shaul! I will try to find out for you! While I don’t know where the songs came from before, Fried sings that same medley on Around the Year 3. Dunno if that helps. Chaim, I am not sure what MBD does or why he sings certain songs, but I agree with you his old songs are nice!